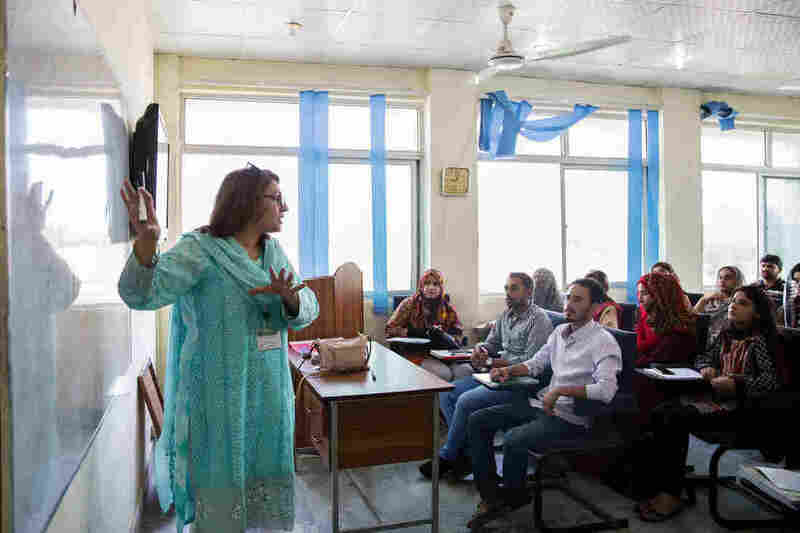 In Pakistan, Learning Chinese Is Cool — And Seen As A Path To Prosperity China's billions in infrastructure investment have led to growing number of Pakistanis eager to learn Mandarin and study in China. Beijing is giving thousands of scholarships to Pakistanis. 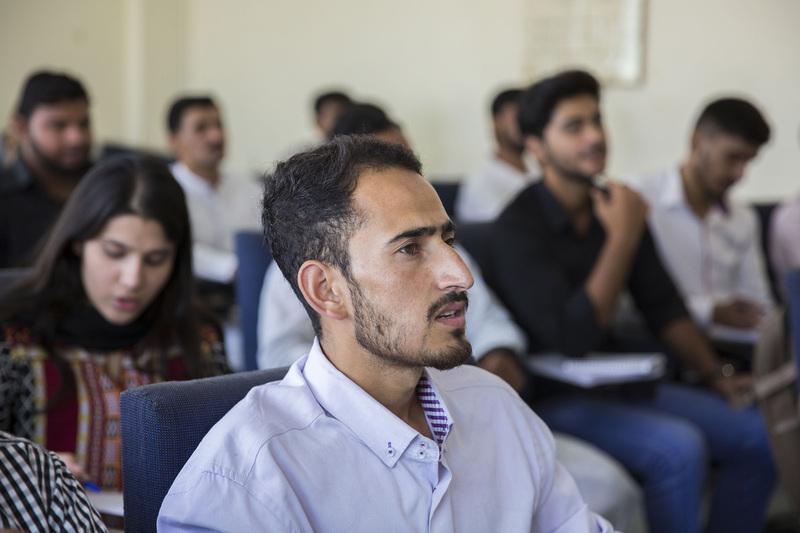 These lessons mean a lot to Abbas, a 17-year-old from a village deep in the Pakistani Himalayas. His father is a retired soldier, and his pension isn't enough to go around. Abbas, one of five siblings, lives with his uncle in a gritty town outside Islamabad, in a room that only contains a thin mattress, where he sleeps and studies. He calls his mother once a month — there's no Internet back home. "Every month, I ask my mother about her health," he says in broken English. "She cries, but I don't cry." His family has staked what little money they have on him. If he masters Mandarin, he can apply for a scholarship to study in China. And with a Chinese degree, he thinks he'll have a chance of getting a good job back in Pakistan as a fluent Mandarin speaker. Then he can pay for his younger brothers and sisters to get advanced educations. Abbas' family has invested heavily in his education, hoping that eventual fluency in Mandarin will lead to a good job that will allow him to help finance the education of his younger siblings. 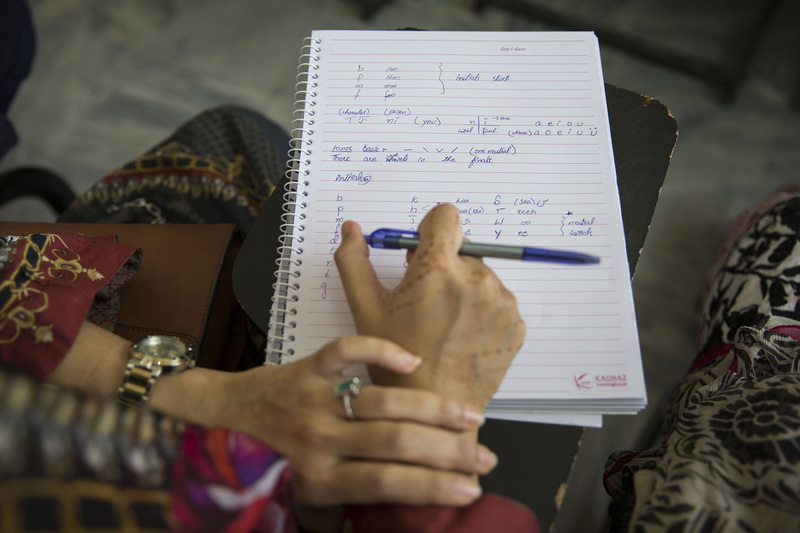 In Pakistan, speaking Mandarin is now seen as a door to prosperity. "Chinese is the language that can make Pakistan prosperous and help Pakistanis get a job," he says. "China can also help Pakistan move forward." 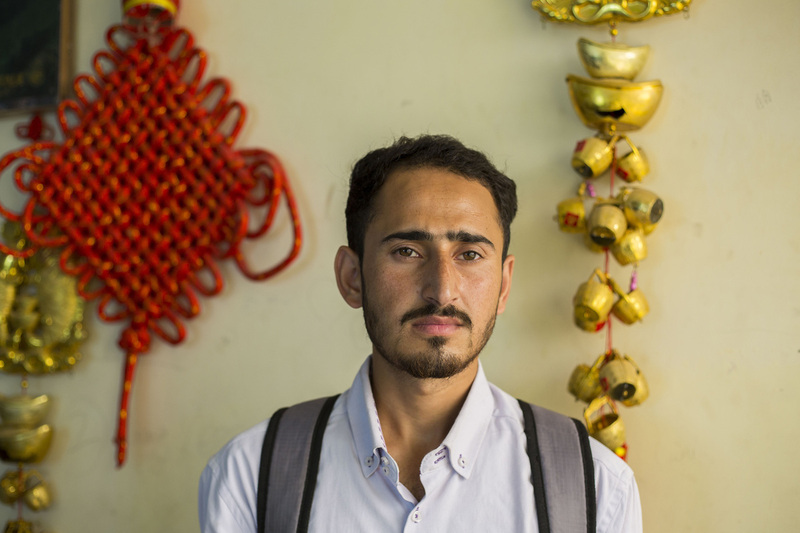 Abbas, who just finished his first year of beginning Mandarin at Islamabad's National University of Modern Languages, is part of a rush to master Mandarin across Pakistan. At least three prominent universities and three private school networks offer the language to hundreds of students. Much of this began in the past few years, after Beijing and Islamabad signed a memorandum of understanding that launched the China-Pakistan Economic Corridor in 2015. It is an ambitious series of infrastructure projects worth more than $50 billion. The mix of investment, loans and Chinese expertise is transforming Pakistan with new roads, metros, a port and power plants. Tens of thousands of Chinese have come to work on these projects. Officials say there's a demand for translators, lawyers and supervisors. But they need to speak Mandarin. Abbas recently finished his first year of beginning Mandarin. "Chinese is the language that can make Pakistan prosperous and help Pakistanis get a job," he says. "China can also help Pakistan move forward." This reflects a profound transformation of Pakistan's relationship with China. The relationship goes back nearly seven decades, and for much of that time, it has been a high-level affair, controlled by military and senior government officials. The relationship centered on security and a loathing of their mutual neighbor, India. It is now also becoming a relationship among people. "I think you start to have something that is a more sort of sustainable cultural basis for the relationship," says Andrew Small, the senior transatlantic fellow at the German Marshall Fund of the United States and author of The China-Pakistan Axis: Asia's New Geopolitics. "It's just been so thin in the past. I think it will be interesting to see to what extent the kind of long-term national outlook does actually change." At the university where Abbas studies, senior Mandarin lecturer Rashida Mustafa says Mandarin has been taught since the early 1970s. For most of that time, there were 20 students per class and three classes — two for beginners and one advanced. Most of the students were military officers, Mustafa says. Now, there are 500 students studying Mandarin, and the university added morning and evening classes. From 10 teachers in 2014, they now have 40, alongside two volunteer teachers that the Chinese Embassy provides. "This demand is becoming bigger and bigger," says Lijian Zhao, the embassy's deputy chief of mission. "From [the] embassy, we have a lot of requests. Many serious universities — they would like to open up Chinese classes and they need Chinese volunteers." 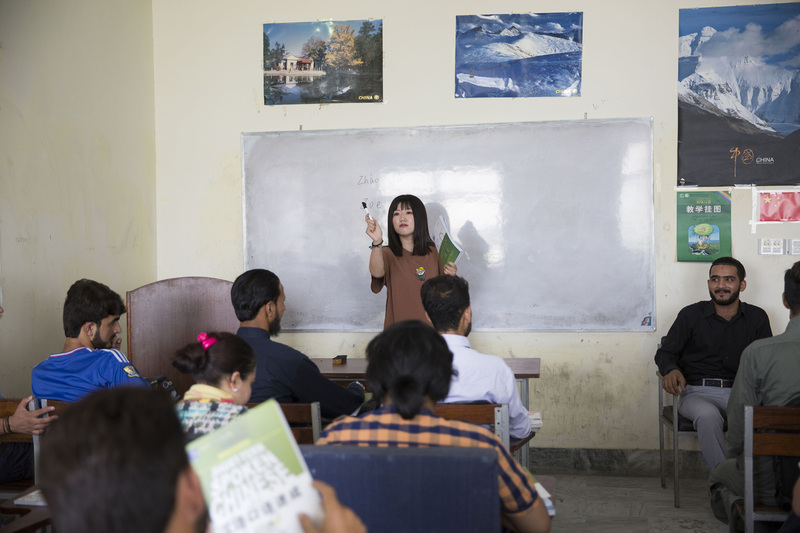 Zhou Xu is a volunteer teacher at a Mandarin class at the National University of Modern Languages in Islamabad. About 500 students are taking Mandarin, and the school has added morning and evening classes. But they don't have enough teachers, Zhao says. To deal with this, the Chinese government and Chinese universities offered some 5,000 scholarships to Pakistanis in 2016, he says — more than to students from any other country. 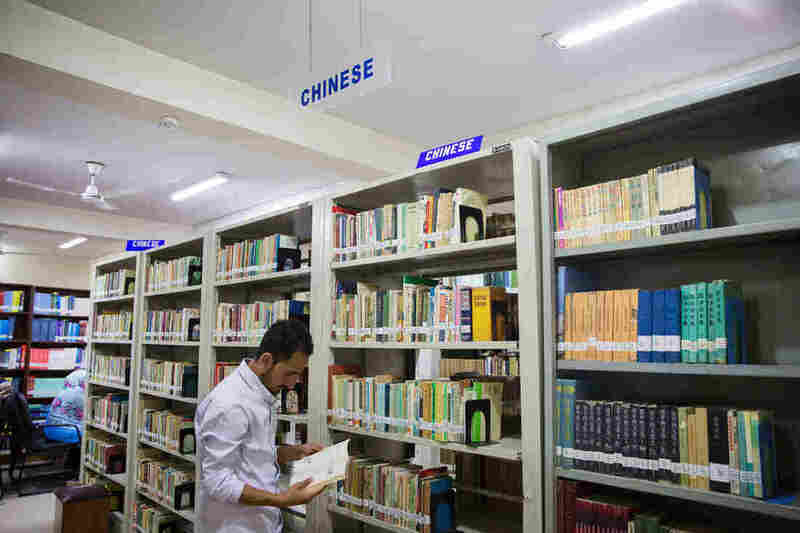 China's hope is that some of the scholarship recipients will return home to teach Mandarin and create a sustainable Pakistani network for teaching the language. 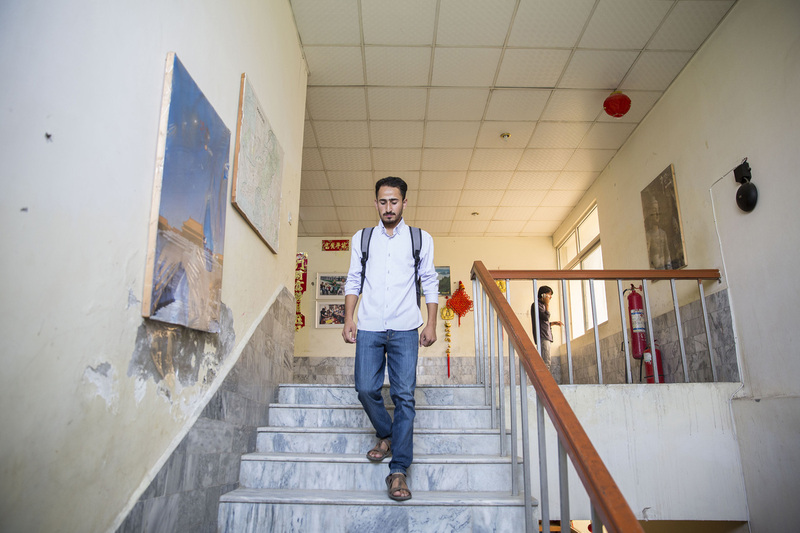 Even without scholarships, it seems Pakistanis are flocking to study in China. In 2016, some 22,000 were studying there, Zhao says — a "more than 10 times increase" over the past six years. Now, he says, Pakistanis rank as the fourth-largest group of foreign students in China, after South Koreans, Americans and Thais. Still, efforts to teach Mandarin in Pakistan are fragile. Mustafa says most students drop out because they are shocked by how difficult it is. "When they start," she says, "maybe after two weeks, they say, 'Oh, Ma'am, it's very difficult, character writing is very difficult.' "
Pakistani officials say there's a demand for translators, lawyers and supervisors who speak Mandarin. Mandarin still falls far behind English, the language overwhelmingly spoken by educated Pakistanis. Elites still send their children to universities in the West. And familiarity does not always build rapport. It is rare to see Chinese and Pakistanis mingling — there are cultural and language gaps, and security restrictions limit the movement of Chinese nationals. The incident, partly caught on video, unleashed rare criticism about Pakistan's relations with China. Many Pakistanis see their country as subservient. "Chinese consider Pakistan and Pakistani people under their thumbs," a reader wrote in response to a Pakistani newspaper story about the incident. That attitude is, in part, because Pakistani officials have kept many financial details of the CPEC projects secret. Closeness, says Small, "exposes China to more dynamics of public opinion and political pressures that it was really very insulated from in the past." 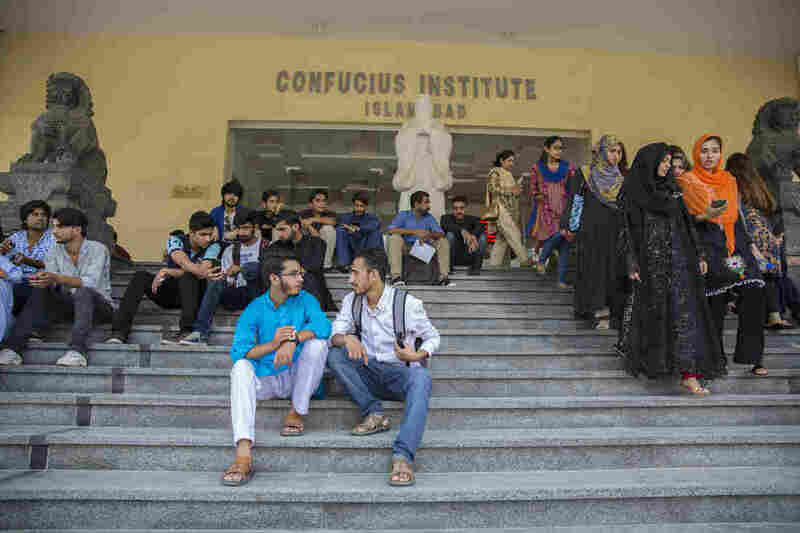 Zhang Daojian, the director of Islamabad's Chinese-run Confucius Institute, which teaches Mandarin to 400 students, says the institute is trying to teach Pakistani students about Chinese culture, hoping to bridge these gaps. His students celebrate Chinese traditions like the Spring Festival or Chinese New Year. Abbas sits with another student, Wajahat Usmani, outside Islamabad's Chinese-run Confucius Institute, which is trying to teach Pakistani students about Chinese culture. Religion is a big sticking point. Daojian says Chinese struggle to understand Islam's outsize role in Pakistan. And Pakistanis struggle to absorb the notion that China does not have a state religion. "This is the big difference, of course, in our culture, in Chinese culture, there is no God and no Allah," Daojian says. "No one created the universe, it's very difficult for us to understand the religion here." Meanwhile, China's massive infrastructure projects are controversial within Pakistan. Many of the agreements regulating CPEC projects are secret. There is concern among some Pakistanis that CPEC, much like China's investments in other developing countries, will lead to unsustainable debt and may erode the country's sovereignty. Despite those issues, there is enthusiasm about China. It's a rare gateway open to Pakistanis who often struggle to obtain visas to the West. Unlike the expensive fees and financial demands on Pakistanis who want, for example, to study in Australia or the U.K., China's universities are relatively more affordable and scholarships are generously available. Pakistanis also say it's easier to obtain visas to China than to those other countries. Abbas hopes for a scholarship to study in China. In 2016, the Chinese government and Chinese universities offered some 5,000 scholarships to Pakistanis — more than to students from any other country. There's a striking sense that China is cool. That's mostly because enough Pakistanis have gone there and spread the word back home. "I like China! I want to visit China," a 21-year-old woman in Islamabad named Anam says in English. "I have friends there, and they say it's an awesome place to live, so I want to visit China once in my life." Anam wears a long black robe, a black hijab and a black veil that obscures her face. She would stick out in China. It doesn't faze her. In a few cases, there has been enough mixing to create lasting personal relationships. Zunaira Mumtaz is Pakistani, and her husband, Yin Hang, is Chinese. They've been married four years and have a daughter, now a toddler. They joke that she's a hybrid. Her mother calls the girl by her Pakistani name, Umul-Baneen. Her father calls her by her Chinese name, Eefay. The couple communicates in English. Mumtaz met Yin on Valentine's Day in 2011. Mumtaz was at an Islamabad hotel for a free acupuncture session. Yin was there translating for the Chinese businesswoman offering the acupuncture. "I saw him there for the first time," Mumtaz says. "I remember she smiled," Yin recalls, "smiling to me." After Yin left Pakistan, they connected over social media. A few months later, he flew to Pakistan to propose. These sorts of relationships so were so unheard of in Pakistan that Mumtaz's father initially refused to give his blessings. It took him four years to approve their union. Yin says it was worth it. "Before marriage, I felt something missing," he said. Once he got married, "I got all I want." Mumtaz says she has noticed more mixed couples popping up across Pakistan. She believes that is because of CPEC. "You see when people are making a road," she says, referring to the massive road works projects, "it's kind of opening to a new world." But the path isn't painless. Mumtaz struggles to learn Mandarin. Without the language, she says, fitting in will be difficult for her in China. And her husband, she says, doesn't think Pakistan is safe for their daughter. They hope to emigrate — maybe to Canada. Their experience sketches out something broader. China's presence is changing Pakistan. But linking two cultures, bringing people closer, may not be as easy as just learning a language. Abbas looks at books in the library at the National University of Modern Languages. Much of the rush to learn Mandarin began after Beijing and Islamabad signed a memorandum of understanding that launched the China-Pakistan Economic Corridor in 2015.